In 1974 - just after 12th grade, I bought myself (with money I had earned and saved) a new 4-valve Miraphone 186 C tuba. In 1977, I bought myself (with money I had earned and saved) a three-year-old 4-speed standard-shift air-conditioned Toyota station wagon. My Dad really didn't buy very much stuff for me. He never volunteered to, and I never asked him to. Were I able to go back in time and actually successfully schmooze my Dad into helping me buy a really nice tuba in 1970 at age 12 (as he had just helped a much-older sibling - beginning their first job out-of-state - purchase a $2000 new/very-basic Chevy Nova), I wonder (??) if I could have actually eventually convinced him to help me buy a $1200 new Miraphone 186 C tuba with 5 rotors. I wonder how much earlier progress I would have made playing the tuba (had I put as much effort into playing the tuba - at age 12 - as I put ...several hours each day... into studying the guitar). OK...Enough with the "oversharing" bull-crap. HAD you (older folks) had the opportunity to purchase a really nice tuba to use in junior high and high school, which make/model would it have been? Further, how make/model-aware (no internet/no nuthin') were you (me: not very much at all) at that age? bloke "I actually didn't view 'tuba' as anything more than a 'class in school' until 11th/12th grades, when I used a fiberglass economy-model Conn sousaphone and a very-leaky-valves 3-valve King tuba (respectively) to audition for chairs in regional and state bands." 1979/80 - A new King 1241 (with cases and upright bell) $1,800 (with no assistance from anyone but myself). Before then, I played on a school-owned Amati BBb with 3 top-action valves. 1980 - A twelve-year-old 4-door Chevy II (Nova) with a 307 V8 and three-on-the-tree - $350 (same purchase circumstances as the tuba). At the time of the tuba purchase (I was @ 17, no internet, and literally no knowledge of music performance beyond my band room) I had no clue as to what to buy. Mr. Butterfield said I should buy a King, and that's what I got, end of story...... (he also said I didn't need 4 valves, but I wisely decided against that advice). Last edited by roweenie on Sun Aug 05, 2018 12:31 pm, edited 1 time in total. * the description called the sound "sonorous". I had no idea what that meant, but it sounded like something I should want. The irony is that I grew up about 3 miles from Baltimore Brass (the current store, or the original shop in Dave's basement). Had I known about that, things might have been quite different, and I could have easily bought something used, and gotten lessons and great advice from the big guy himself. I was probably 21 or 22 before I learned about Baltimore Brass. If I would have known about that store in my formative years, things couuld have been way different. My band director didn't know about it, and I guess I wasn't motivated or creative enough to find out for myself. Things worked out very well in the end, and I'll eventually be one of those people with a PhD in something non music, who spends all of his time doing tuba stuff. Not rich, not broke, and playing tuba for fun. Living the dream! In your scenario of turning back the clock, I would have started sooner on tuba, pressured Dad for the same BBb 186 (albeit probably in a fixed upright instead) - it was and probably still is an amazing horn. And then sought lessons or at least guidance from Mr. Bobo or Mr. Johnson, both local to me then. Had that revised history played-out, I would have likely pursued a music degree, enjoyed college a helluva lot more, and possibly have been a symphony professional at some time in my life. Interesting question. Since turning 50 recently--and being somewhat shocked that so much time has slipped by--I spent some time thinking about decisions made at "turning points" throughout my life. I won't go all "soft-focus/wistful voice-over"--that's not the topic here and I'm sure y'all don't care. But, this question came up: "What if I'd gotten my own tuba sooner in life...?" Anyway, here's my story. If it were possible to have gotten my own tuba the first time that I felt like I really wanted to stick with it, it'd probably have been a MW 25 BBb--just like the two that my band director (a fine trombone player and excellent music educator, whom I am grateful for meeting to this day--Bob Spiegelhalter) selected for the band. In hindsight, I think that would have been a wise choice; at the time, I just would have been trusting Mr Spiegelhalter's judgement. However, not long after that time I joined T.U.B.A--as it was called then--and got regular copies of the journal containing all those beautiful ads for various manufacturer's horns. The most appealing to me at the time were the Hirsbrunner adds. Other boys had posters of Farrah Fawcett, Camaros, Mustangs, and the occasional Pink Floyd black-light poster. Me...I coveted those beautiful silver beauties with all that curvaceous tubing. I was convinced that if I was going to make a living playing tuba that I NEEDED an entire quiver of those things to make it. In hindsight (pun intended) that was flat-out childish and delusional. It only took a few lessons from Art Hicks--who at the time was playing an ancient Sander CC in the LO--to disabuse me of that notion. No horn ever played itself; attention to detail and careful, structured practice were the keys to success, but you still had to know which doors to try to open with them. This brings me to my first horn that I purchased--with the help of two influential teachers. It wasn't until my sophomore year at TTU that I was able to purchase my own tuba--one about as far from my childhood crush as any could be, but was definitely the right horn at the time. Mr Morris managed to talk a previous student, who after 10 or so years as a lawyer was almost ready to sell his horn, to part with an early '70s Miraphone 185. The price was more than reasonable, but still more than I'd saved at the time. My uncle--a music minister in Atlanta at the time and who was a pivotal influence on me and a guide who helped me gain the confidence that there were MANY ways to commit to music in my life--heard somehow that I was just a bit short of the funds needed for the purchase. He (and my aunt) generously made up the difference and I was able to purchase the horn on which I played through school and into my first (and last...but, that's another story) professional job. Anyway, thanks for taking the time to read this. I look forward to hearing from others. My first teacher (and no one I've studied with subsequently, seemingly) didn't put much emphasis on "tuning". That person owned a 4-valve 186 C with a main slide (very long crook) that keep it from playing quite up to pitch. ...so (having foregone spending the extra $250 for a 5th valve) I plodded along with 1-2-4 (etc.) for low F (wildly flat) and 2-4 (wildly sharp) for low F#, and mostly avoided studying low excerpts. As a guitarist, my own emphasis had - very much - been on tuning and temperament (compromising the tuning of strings for the best over-all sounds of most chords, and special re-tuning to play music in particular keys...(yeah...I was a snooty-poot nylon-string player). Curiously, that first teacher later got into piano tuning, and (needless to say) their tastes-in/requirements-of tubas that they chose to own changed dramatically. King 1241 for "roweenie" was very good pick, in my view (just fwiw). 1971 - Bought a 1962 Ford Falcon station wagon for $15. Drove it thousands of miles with band-aids all over it. 1969 - 1972 Was extremely lucky that my H.S. had a wonderful front action 4-valve Martin with upright bell. That horn and lots of practice provided me with a four year scholarship ride at the U. of Iowa. 1972 Was guided by my soon-to be tuba professor in buying (my own money) a new Willson made Marzan CC. 1972 - 1976 My income during collage was provided by gigging around with the last vestiges of actual WORKING dixieland and dance bands in eastern IA. Played and subbed with some of the great but lesser known old time players (ie: Smokey Stover, Wingy Malone, Lyle Drollinger, etc.) Best night ever was jamming with Benny Goodman, Slam Stewart, and Bucky Pizzarelli. Was fortunate in that the siren of ego didn't lead me down the path of a full time professional tubist. Instead, I got another degree in medical care and I continue to play with excellent non-famous musicians in obscure places. Bought a new Mirafone 185-5U CC in 9th grade....newspaper routes were great. $945 for the tuba. I had paper routes as well. When Wichita Band Instrument Company decided to "go national", they were sending out mailed advertising with LOW prices of Miraphone tubas. In 1976, I believe I bought a 184 C from them for $1400 or so (when my parents were out of town, I mailed them a check...again: my own money...and "parents out-of-town" avoided me - a 19-year-old - being interrogated about spending money that I, myself, had earned playing/recording music). I just couldn't get myself to pull the trigger on a Miraphone 180-F. I had spent some time with one, and (though Mr. Bobo proved "its not the tuba") I just couldn't get a grasp on "giving it what it needed" to make it go. Two years later, I picked up an old Alexander C that was beat up. I took it to a repair shop (two morons/drunks) that charged me a bunch of money, buffed a hole in the upper bow, and ruined all four of the rotary valves. At that point in time, it occurred to me that there was a "great need" in an industry other than the "tuba playing" industry. In '75 thru '76, I would have bought a Miraphone 186BBb. The only other tubas that I knew existed back then were sousaphones made by King or Conn. The only upright concert type tubas I had been exposed to were Miraphone 186's. I'm just crazy about dementia. Location: I am neither here, nor there. 1967 - With my own money I bought a new Conn 88h trombone and a 1961 Mercedes 190D with 100,000 miles on it. I drove the Mercedes five years and another 100,000 miles. I still have and play the 88h, so it was the better investment. A 1967 Conn 10j tuba joined it later. Back when I was in high school, the only nice tuba brand I was aware of was Hirsbrunner. So that's what I would've begged n' pleaded for. Ten years after that, I knew it wouldn't have made much difference, and was happy that I didn't blow the cash on it. 40 years later: The bass bone is long gone due to bad ergonomics and serious build quality problems, replaced by a Courtois I still play occasionally. For 25 years I have my Besson 982 Eb and after a lot of research and hunting I found my Courtois French C, now on the way to repair of corrosion leaks and retirement, while I play the Wessex. I had tried to play a Besson Eb comp. 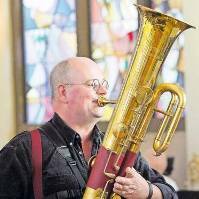 during that same 1970's era but (making a typical mistake that many players make) I tried to blow it the same way my other tuba needed to be blown...which didn't work out very well. Soon thereafter, I heard Dr. Gourlay play one in concert, and realized that I needed to reevaluate (i.e. "different instruments - even if similar - require being approached in very different ways"). I eventually ended up with an Edgware St.-made comp. Eb myself, and use it (possibly...??) for more engagements annually than my other tubas...though those who work with me at "music reading" gigs (orchestras/quintets/etc.) probably have no idea that I even own a compensating Eb tuba. I'm still relatively young, but something I do regret not accepting is that in 2006 when I was a senior in high school our band program received a fairly large endowment, that was used to replace old instruments and our band director offered to let us have our old horn rather than resigning them to district storage(read graveyard). I didn't take him up on the offer, the only person who did was one of the flute players that we press ganged into low brass. Sadly press ganging was the only way for my school to get Tuba players. I was in the programs for six years at that school, and there was not a single tuba player who started their band career on tuba. So I went through French Horn, Baritone and drums then dropped out of band in 7th grade. Regretted it soon after. Went to our teacher and basically it was " I need a tuba player. Take it or leave it". So I started out on Yamaha 201's in grade school. High school had beat to $%&^ Mirafone 186 BB's. Loved the Mirafones but I always wanted one of the Conn 2xj's. If I would have saved my pennies for anything it would have been a Conn 20J. I loved the sound of them then and still do. 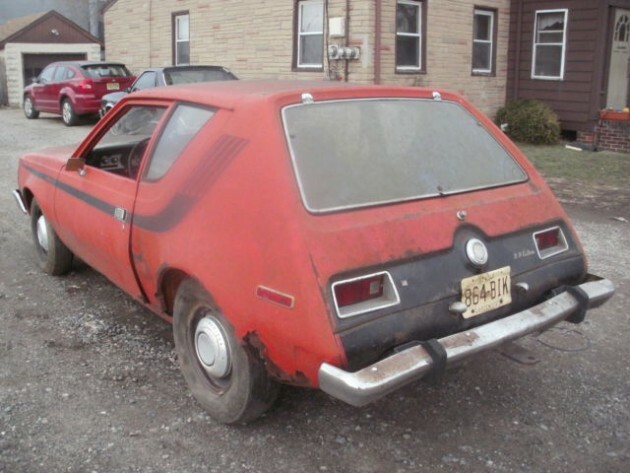 First car was a 76 AMC Pacer. You ever try to get a date when you're a tuba player that drives a fishbowl? At least It had a hatchback to load the tuba in. Brother! I thought that I was the only tuba player to own a Pacer. Mine was denim blue but the gel coat was falling off—it looked like it had a skin disease. My insurance agent gave me a box of band-aids—said I’d need them if I ever got into an accident, since the thing was about half glass. Our first house was an 1100 (almost) sq.ft. 2 BR 1 ba house. Formerly it had one of those concrete "side porches" (remember those, in the old redneck neighborhoods? ), but someone before us enclosed that, bricked it to match, and extended the new construction all the way to the back (resulting in a large kitchen with a "study" in front of it)...so - prior to that - it was probably an 8XX sq.ft. house. It was in a cove. The house at the bottom of the cove was owned by a couple of alcoholic parents. Sadly, we had to witness their alcoholism - along with the cancer death of one of their small children. Aside from me "over-sharing" here, that guy had one of those worthless ( speaking of AMC) Gremlin AMC cars. I remember AMC- my parents had a '69 Rebel. 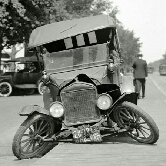 As long as you maintained them, those were "the cars that would not die". Your neighbor's Gremlin obviously needed work, and we all know why it didn't get fixed, eh? I had a neighbor who would get up and mow his lawn every Saturday at 6 AM. He had me service his mower for a while- "oh, you need a new muffler" and I put on the quietest one I could get. After that I could sleep in. The Sonora was the first tuba I owned- we got it my senior year of high school, brand new.